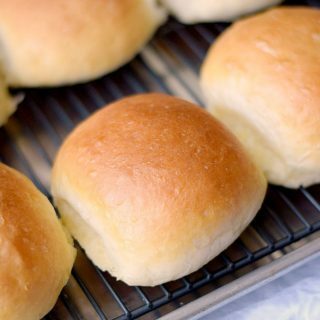 As I was creating the Guinness Glaze post last week, I realized that I have never created a post for these delicious Homemade Hamburger Buns: Cooking 101! I can be such a slacker!! So here it goes….. If you have been around for awhile, you know that I always use my bread machine…..unless it is not working for some reason. The recipe below is the original recipe written in the order than you would put the ingredients into your bread machine. I like being able to continue on with my day, and let the machine do all of the work. Sometimes I even forget about it, and it gets a bit too puffy…..
That’s okay, it will still work just fine! Heat the water to 110 – 115 degrees, add the sugar and the yeast and wait 5 – 10 minutes for it to proof…..
Yours might not be this puffy…I think this is the yeast photos for the Lemon Curd Sweet Rolls. 😉 Place into your stand mixer with remaining ingredients and mix until well combined, about 4 minutes…..
Cover and allow to rise until doubled, about 1 1/2 hours. 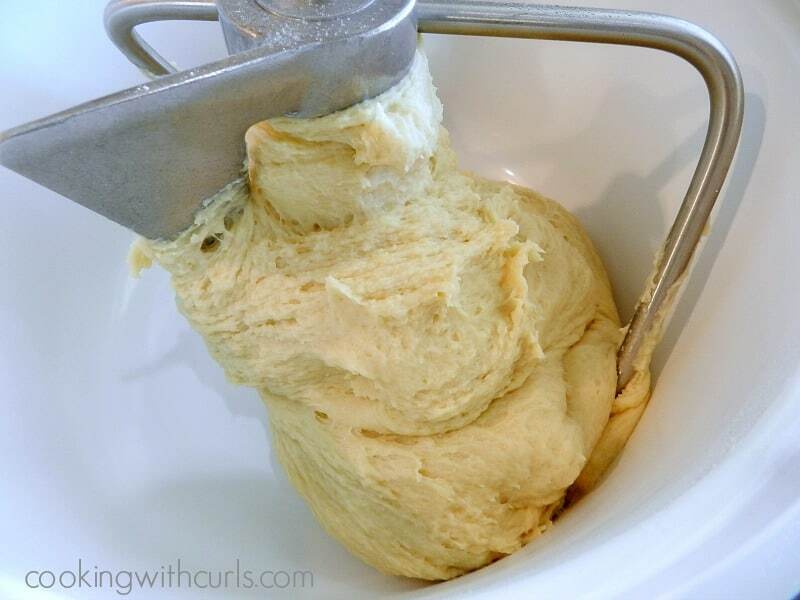 Either way, remove the dough and roll into a large ball on a well floured work surface. 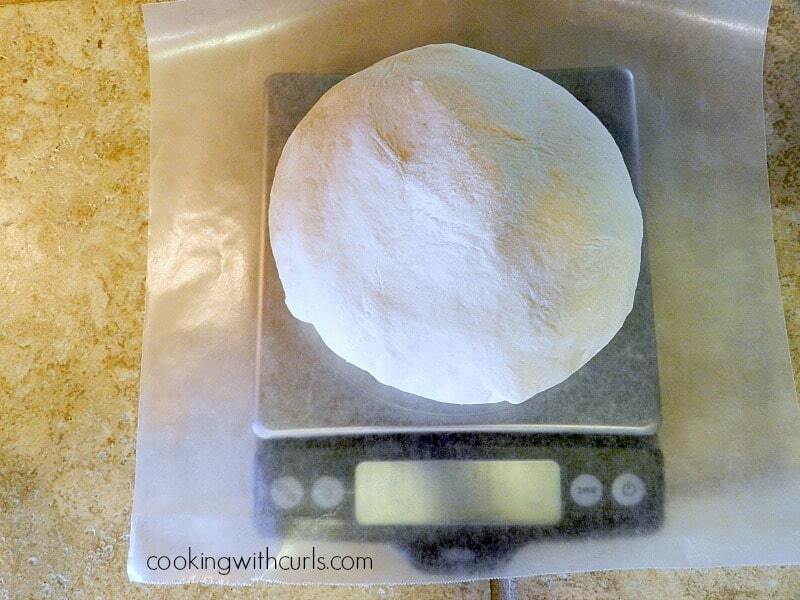 Place the dough on a scale to weigh….. This is not mandatory, but it makes it much easier to divide. You will need 8 to 12 equal pieces of dough. Roll into balls and place on a silpat/parchment paper lined baking sheet. Cover with a towel and let rise in a warm location until doubled, yes that means an additional hour…but it is totally worth it! Preheat oven to 375 degrees, brush tops with half of the melted butter, and bake for 15 – 18 minutes or until golden brown….. Remove them from the oven and brush with the remaining melted butter…unless you topped them with sesame seeds before you baked them….. They turn out light and fluffy every time. The hardest part is cutting them in half evenly….. 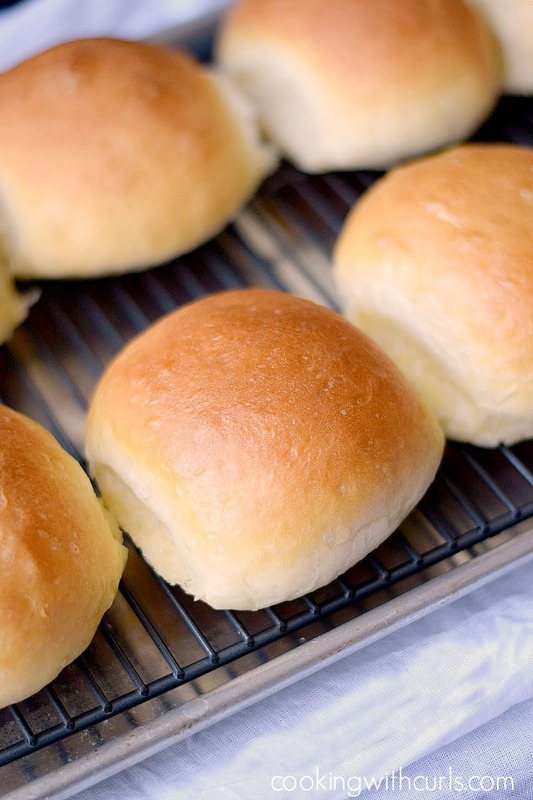 This is the one and only recipe for the BEST Homemade Hamburger Buns that you will ever need!! Place ingredients into the pan in the order suggested by the manufacturer. Mine is a Breadman, so liquids go first. Pour hot water, butter, sugar, salt, and beaten egg into the pan of your machine. Add the flour. 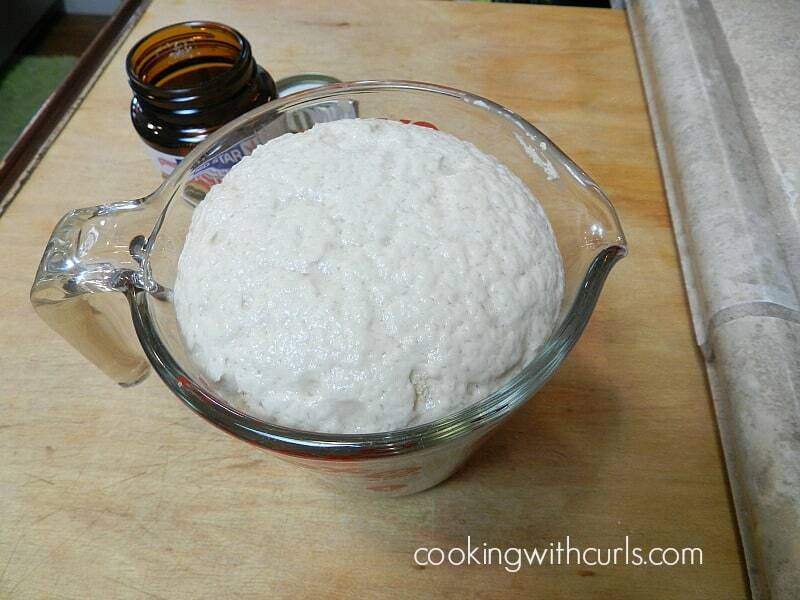 Make a small indentation in the center of the flour, and pour in the yeast. Place pan in the bread machine. Plug in the machine and press the "dough" cycle button. When the machine "beeps", check thru the window to see if the dough has risen sufficiently. DO NOT OPEN the machine if you can see inside, it lets the heat escape. 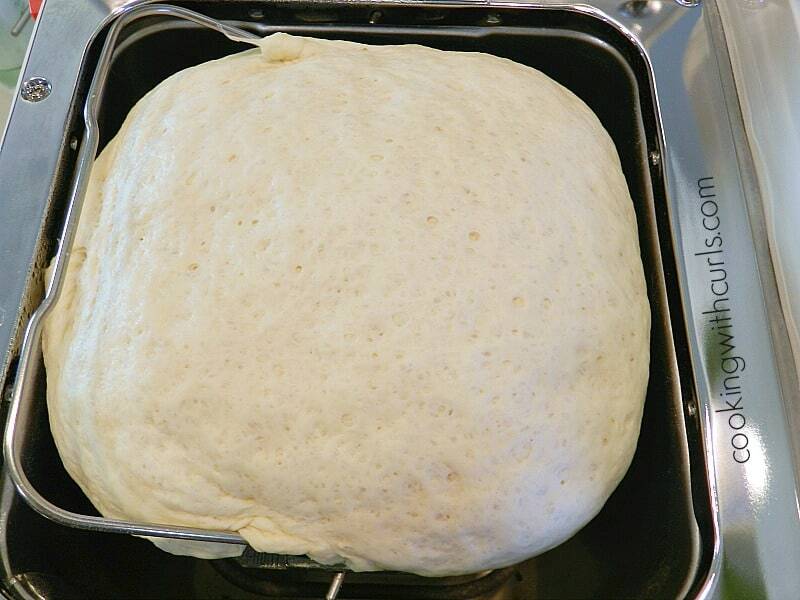 If the dough does not appear to have risen (it should be near the top) then leave the lid closed and let it continue to rise. 30 - 60 minutes more will not hurt it. Heat the water to 110 – 115 degrees, add the sugar and the yeast and wait 5 – 10 minutes for it to proof. Place into your stand mixer with remaining ingredients and mix until well combined, about 4 minutes. Cover and allow to rise until doubled, about 1 1/2 hours. 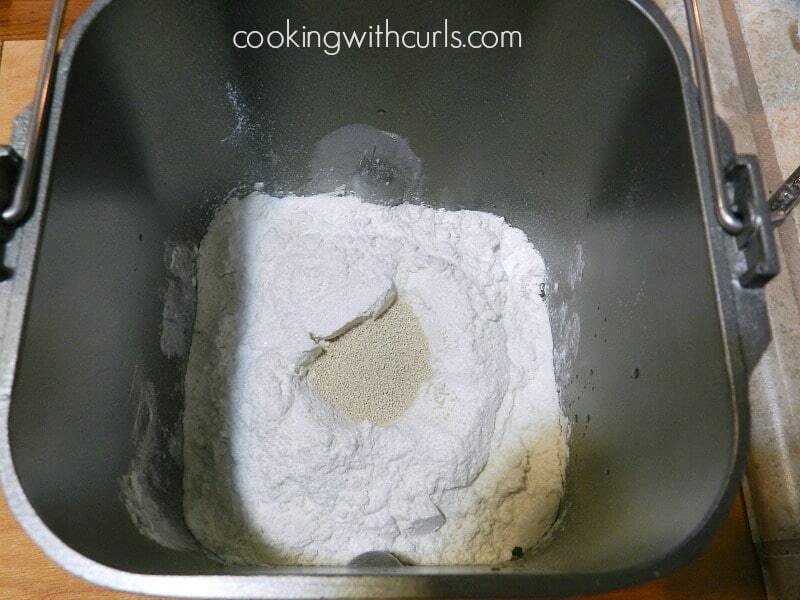 Remove dough and place on a well floured surface. 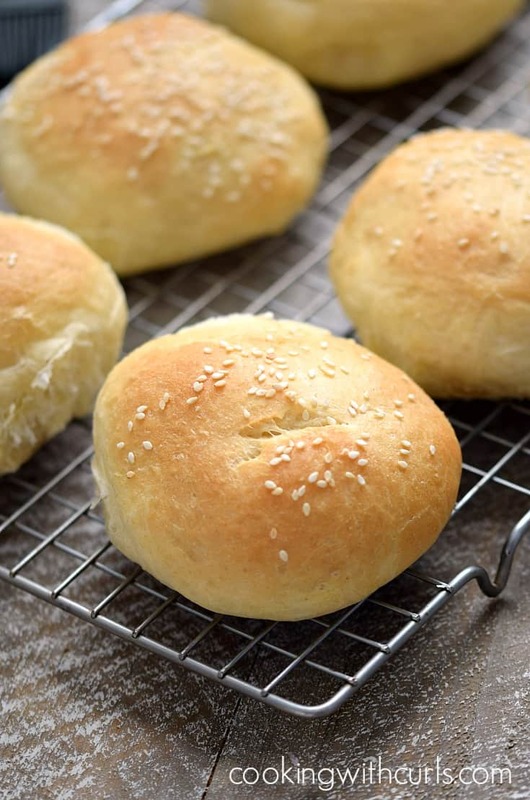 Roll dough into a large ball and smooth and squish around in a circle to release the air bubbles. At this point I weigh my dough. It is usually about 1lb 14 5/8 ounces. This will give me (8) 3 3/4 ounce balls of dough. Or you can simply separate the dough into 8 equal pieces. Place dough balls on a parchment paper or silpat lined baking sheet. Cover with a towel and let rise in a warm place until doubled in size, about 1 hour. Place in a preheated 375 degree oven for 15 - 18 minutes, or until golden brown. Remove buns from the oven and brush with the remaining butter. This dough is very forgiving. I usually start the dough and then go do whatever I need to do. Go to the store, take a shower, you have 1 1/2 hours while the machine does all of the work. Divide and separate, then allow to rise for a second time. I have forgotten them before and they turned out just fine! Hey Lisa, nice buns! Sorry I couldn’t resist saying that 🙂 But I’ve always wanted to try and make my own – you make it look easy! And I think you and I, besides lemons, love a good burger! 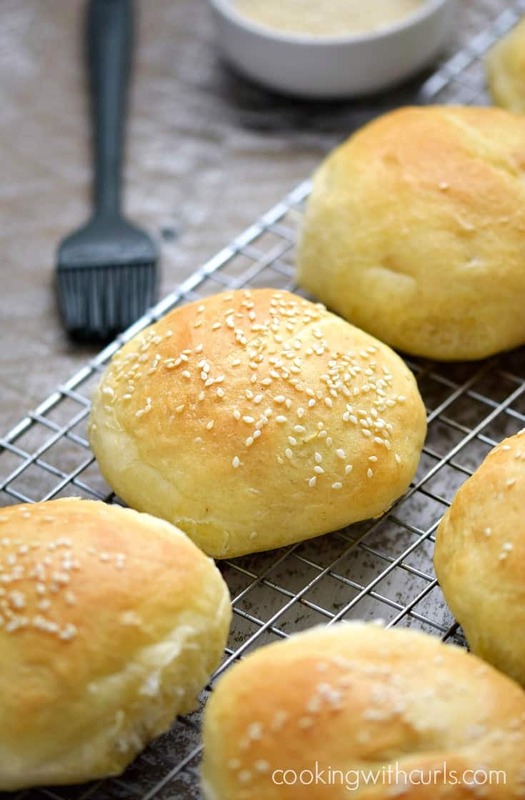 I really want to make homemade hamburger buns — these look so great! I’m all about the sesame seeds on top, too. You know me and am all about homemade… it just tastes better. Those store bought buns have such a funny texture to them. Makes me wonder if they are even made with dough in the first place. Right? Can’t wait to make these. I’m bookmarking, printing out, and pinning! These buns look great, Lisa. 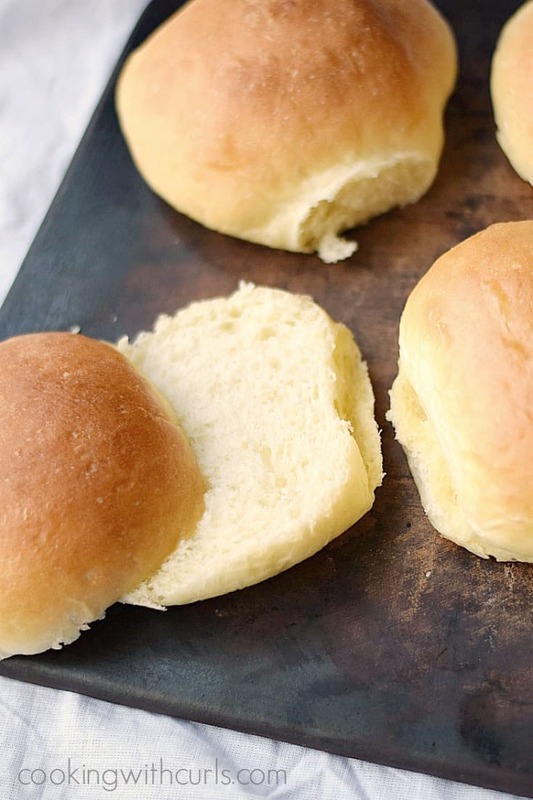 I love homemade breads and buns. These look delicious and so much better than store bought. Thanks for sharing! We recently decided that we’re giving up store-bought bread …. something tells me this recipe will come in handy in the very near future!! 🙂 Pinned it! They are very soft and quite addicting! LOL, I had to say that. 😉 I need to start working on an everyday sandwich bread so I can do the same. There are some scary chemicals in there!! I also want to stop buying store bought bread . I am worried about if it has ADA in it . The last rolls I did buy tasted awful it ruined my sandwich . I have been making bread in my bread machine for my 10 yr old and he said we should also make our own because he likes homemade better. These look amazing! Can’t wait to try them. I have a stone that looks just like yours! Love it, use it daily. These look awesome! I wish I had a bread machine and a stand mixer…some day. Thanks so much Cindy. 🙂 I won my stand mixer in a giveaway, or I wouldn’t have one either. Outstanding!! Yeah, this was the most clicked link last week at Freedom Fridays With All My Bloggy Friends!! Ps of course you always rock it!! I made these last week and the are perfect! I’d like to make a double batch and freeze some. I’m wondering if I should freeze after I’ve baked them or flash freeze the dough buns? Well, I made 12 this time and they were too small. So next time…10! They are so good! “I like being able to continue on with my day, and let the machine do all of the work. Sometimes I even forget about it, and it gets a bit too puffy” —–>>>> I can so relate to this Lisa LOL. Trying these buns. I haven’t done anything with my bread machine yet except loaves. I was making it without a bread machine and misread the instructions #fail. I forgot to let them rise before I formed them into the balls. Should I let it rise double the time now? Let it rise the normal amount? Or did I screw up beyond the point of fixing? Thanks! Oh no! This is probably too late now, but you can always let them rise until the are the size that you would like them to be after they are formed. Yeast is way more forgiving than the “experts” claim it is.